The first owner of the St. Louis Browns, Robert Hedges was a visionary leader, years ahead of his time. He was also a shrewd businessman who maximized the value of his baseball franchise, in spite of its mostly losing ways. Hedges' innovations and financial success in baseball contrasted vividly with his teams' lack of success on the diamond. He saw his club through two great baseball wars and took pride in not losing a single player to a rival league. 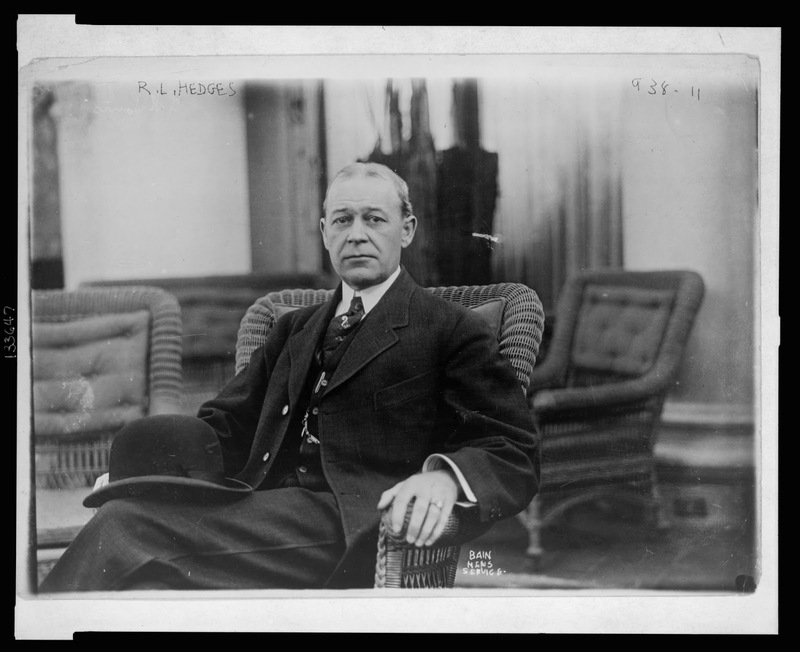 Hedges played a critical role in settling both of those conflicts, the American League-National League war of 1901-1902 and the Federal League war of 1914-1915. "Colonel Bob," as he was known, spoke out against the concentration of wealth in baseball. He was the man who hired Branch Rickey and laid out a vision of the farm system--to compete against that wealth--that Rickey later rolled out with the St. Louis Cardinals. Hedges' signing of college star George Sisler triggered a conflict that hastened the end of the three-man National Commission, baseball's governing body. When Hedges died in 1932, The Sporting News wrote in an editorial, "It was his pioneering and business acumen that helped to lift it [organized baseball] from a haphazard happy-go-lucky sort of sport into a national pastime." Robert Lee Hedges, a bold and handsome self-made man, was born in 1869 on a farm in Jackson County, near Kansas City, Missouri. His father died when he was ten, and his brothers were killed in the devastating Kansas City tornado of 1886. From the mid-1880s until 1890, he was a clerk in the office of the Recorder of Deeds in Kansas City. In the early 1890s, he started a buggy manufacturing company in Hamilton, Ohio, near Cincinnati. His financial and management skills helped him weather the economic panic of 1893, and he thus came to the attention of midwestern bankers. He sold his carriage business in the boom times of 1900, in part because he saw the emergence of the auto industry and the threat it posed. He then worked for J.P. Morgan doing business deals in what the Globe-Democrat described as "that frenzied period." American League president Ban Johnson, also from Cincinnati, persuaded Hedges to buy the Milwaukee franchise of the fledgling American League after the inaugural 1901 season. Former Milwaukee owner Henry Killilea remained as club president for the 1902 season. Hedges paid around $35,000 for the team and then moved it to the nation's fourth largest city, St. Louis. He called the team the Browns, a name that had been abandoned by the city's National League franchise, now known as the Cardinals. The name "Browns" had a rich and winning tradition in the city: the St. Louis Browns of the American Association had won four pennants in the mid-1880s. Hedges also refurbished the old Browns' Sportsman's Park, only a few blocks from the Cardinals' League Park (later renamed Robison Field). From the start, he viewed the venture as a commercial enterprise, one that would require constant focus on the balance sheet and bottom line. "I went into baseball purely as a matter of business," Hedges was quoted in a July 1912 article in McClure's, "The Business of Baseball." He started out as a minority stockholder and grew his share of the club both slowly and cheaply. By 1903, he moved up from secretary to president of the club. Hedges acquired a team with modest talent. The Milwaukee Brewers had finished the 1901 season in last place. The American League drew quite well that inaugural season (within 12% of the NL), primarily by raiding the established National League of some of its biggest stars, including Cardinals' pitcher Cy Young and the great second baseman Napoleon Lajoie. Hedges then put into play the most spectacular raid of one team by another in baseball history. First, he replaced Brewers manager Hugh Duffy with Jimmy McAleer, who had played for Frank Robison's Cleveland Spiders. In 1899, Robison had moved the Spiders' best players to the St. Louis team he had just bought, by 1901 called the Cardinals. Working closely with Hedges and AL president Ban Johnson, McAleer signed virtually every star from the 1901 Cardinals for the 1902 Browns. The only exception was Patsy Donovan, who was the Cardinals' player-manager. And so the St. Louis Cardinals had done to them just what they had done to the Cleveland Spiders. The Cardinals brought suit to stop Harper, Heidrick, and Wallace from jumping. The far-reaching case would have an enormous impact on the Browns' viability. The controversy was front-page news in St. Louis and split the city's sports fans into warring factions. Hedges prevailed that April, when the judge denied the Cardinals' injunction for a number of reasons: the abrogation of personal liberty, the violation of antitrust laws, and the lack of mutuality. The latter referred to the owners' right (in the standard contract) to release a player on ten days' notice. The contract didn't give the player the reciprocal right to leave on ten days' notice. "Personal liberty consists of the right to go where one pleases," the judge wrote. The Reserve Clause, which the owners said gave them control over players beyond the contract year, conflicted with antitrust laws, he declared. That personnel success came at quite a cost. Bobby Wallace was a National League star, a magician in the field who was coming off a great season at the bat, .324 in 1901. He joined the Browns for what was then the biggest contract in baseball: $32,500 for five years, with the first year paid in advance (The Sporting News, December 20, 1902 and April 7, 1954). Hedges' raids on the Cardinals created a backlash of support for the National League team. "The faithful never forgave him [Hedges] for wrecking the best team the town ever had," wrote The Times (St. Louis) at the start of the 1908 season. In retrospect, said Hedges, he should have followed the strategy of the New York Americans. Rather than raiding the Giants, they signed stars from another city altogether, Pittsburgh (The Times, St. Louis, April 23, 1908). During that giddy summer of '02, Hedges was planning for the future. "We are in a position to pay as much as anyone for those we want." (Sporting Life, September 6, 1902) And one of those he wanted was a rising star pitcher of the New York Giants, Christy Mathewson. Robert Hedges signed him and his regular catcher, Frank Bowerman, to "ironclad" contracts (ten-day clause removed), which included a cash advance. The Giants were a sorry club in disarray at the time, while the Browns were in contention for most of that season. The American League's war with the established National League continued at a fever pitch that year, with players jumping from one league to the other and, in some cases, back again. The American League was looking more and more like a winner in the war (the AL would outdraw the NL by more than 30% in 1902). With salary inflation driving down owners' profits in both leagues, the conflict came to an end at a January 1903 peace conference. Hedges, McAleer, and the Browns didn't come close to that first year's performance during the next five years. They sunk to the second division and stayed there, until 1908. That year, key trades for veteran players--including famous pitchers Bill Dinneen and Rube Waddell--propelled the Browns into a spectacular pennant race. The two aging hurlers had great comeback seasons, combining for 33 wins, and the Browns were in the hunt for the pennant until late September. The club drew more than 600,000 fans that year (more than the pennant-winning season of 1944 and second only to the great 1922 season), and Bob Hedges made a profit of $165,000. Hedges took a significant portion of that profit ($75,000, reported the Post-Dispatch on December 23, 1910) and plowed it back into the ballpark. He reconfigured Sportsman's Park, shifting the field 180 degrees, remodeled and expanded the stadium, with a modern double-decked grandstand of steel and concrete. St. Louis had a long history of wooden stadium fires, including five in the 1890s and another one in 1901. Philadelphia's Shibe Park is usually credited as the first steel and concrete sports stadium, yet Sportsman's Park, built that same year, has a claim too. Since Hedges reconfigured the park, and the old grandstand became the bleachers of the new ballpark, it was not entirely new nor was it completely steel and concrete, since the bleachers were the old wooden stands. The new ballpark was simply one of many innovations that Robert Hedges introduced. More than anything else, he took steps to clean up the image and reality of baseball, which had been a ruffian's game with rowdy fans. He was "a reproduction of the American League policy," wrote Keener (The Times, September 19, 1917), sharing Ban Johnson's vision of baseball as a civil affair, family entertainment. Hedges hired security guards and banned the sale of alcohol at Sportsman's Park, to convey a sense of safety and sobriety. Uncle Bob's brand of baseball was safe and pleasant. Most of Robert Hedges' seasons were losing ones (record-wise), yet most were also profitable. A shrewd asset manager, he was conservative with his money decisions. Even in 1908, when he "splurged" on veteran players (not only Dinneen and Waddell, but also Jimmy Williams, Danny Hoffman, and Hobe Ferris), his expenditure of $25,000 netted him the profit of $165,000. He also benefited from the action of the Missouri state legislature, when it banned horse racing in 1905. Baseball was then the only big outdoor amusement. Yet jealousy figured in here, too, because Robert Hedges knew how to make money at baseball like no one else. The Sporting News put it this way (December 30, 1915): "He always had players who cost little, to trade for players who were worth much. In this way he saved his club hundreds of thousands of dollars." Hedges was extremely active in the minor league drafts, with the help of his scouts. (Charley Barrett, who would go on to a long career with Branch Rickey's St. Louis Cardinals, was his last one.) The Browns drafted more players than any other team in 1912 and 1913, for example. They had working relationships with a number of minor league teams, and John Sheridan of The Sporting News noted that Hedges "always had secret strings on scores of minor league players." (December 23, 1915) A couple of weeks earlier, The Sporting News noted that Hedges got $15,000 from the Detroit Tigers in the deal that sent "Big Bill" James to the Motor City team. A fascinating and complex picture emerges. One of Hedges' scouts, former pitcher Harry Howell, said, "Mr. Hedges was willing to pay almost any reasonable price for players." (The Times, December 9, 1910) If Hedges did spend money and was so savvy in the drafting of minor leaguers, why did his Browns develop so few stars of their own? First, he and his scouts often did not uncover the best talent. Second, he often sold the talent they found for cash and deposited the profit in the bank, rather than putting the personnel in his starting line-up. Hedges was in the midst of a difficult time with the management of his Browns, after their near miss of 1908. In 1909, it seemed that his entire pitching staff grew old together and were not as effective as they'd been in the past: Bill Dinneen, 33; Harry Howell, 32; Jack Powell, 34; and Rube Waddell, 32 (player's age is that at start of season). The collapse of 1909 (a seventh-place finish) on the heels of the fine 1908 season led to a break with the only manager the team had ever known, Jimmy McAleer. Hedges then made unfortunate choices in skippers and went through three managers in less than three years. Twenty-year veteran player Jack O'Connor managed the team to 107 losses in 1910. In a season-ending double-header, the Browns let Cleveland second baseman Napoleon Lajoie get seven bunt hits and tried to influence the official scorer to change an error into a hit for Lajoie, all to help him wrest the batting title from the unpopular Ty Cobb. League president Ban Johnson was outraged and persuaded Hedges to fire O'Connor and his coach, former Browns pitcher Harry Howell. While O'Connor accepted responsibility and expressed regret, he maintained that the idea came from his players. Since the games had no impact on the pennant race, he had let their plan unfold. O'Connor successfully sued to recover his 1911 salary (he had a two-year contract), but neither he nor Howell was ever again involved with major league baseball. It was a sad outcome to an unfortunate affair. O'Connor had been one of Johnson's key lieutenants in recruiting some 1902 Pittsburgh Pirates (of which O'Connor was a member), including pitcher Jack Chesbro, for the New York American League team. And Howell had been such an important member of the Browns. From 1904 to 1908, he pitched more than 1,500 innings and won 77 games for them. He then became a coach and scout for the team. Now they were both gone from the Browns. That winter (1910-11), Robert Hedges decided to sell his team. He was worn out from losing, frustrated by the criticism of the fans, and feeling the heat from the other owners, as well as from Ban Johnson. A St. Louis syndicate paid Hedges $30,000 for an option to buy the Browns. The deal was "so far along" that in January 12, 1911, The Sporting News ran an article and large cartoon entitled "A Sob from Bob: The Heart of Robert Lee will be with Us." Hedges sadly talked of his imminent sale of the Browns. Yet the syndicate was plagued by internal bickering and never came through with the money to close the deal (The Sporting News, July 25, 1914 and July 4, 1940). Thirty thousand dollars richer, Hedges still had his Browns. He then turned to a longtime personal friend and St. Louis fan favorite, Bobby Wallace, to manage his club. Many people felt that Wallace was too mild-mannered for the job. The Browns again lost 107 games in 1911, and early in 1912, Wallace readily gave up the reigns. He was simply not comfortable in the position. Hedges then hired fiery George Stovall as player-manager. Early in the 1913 season, Stovall had a celebrated run-in with an umpire, when he spat a wad of tobacco into the face of arbiter Charlie Ferguson. It was around this time that Robert Hedges introduced perhaps his most far-reaching innovation. He hired as his confidante and executive assistant a man with a most unusual background: a lawyer and a teacher who had impressed Hedges as a person, more than as a catcher, when he was on the Browns a few years earlier. His name was Branch Rickey. He had "a most definite idea of what constituted skill and latent ability in a baseball player," wrote Rickey's biographer Arthur Mann. Hedges hired him for $7,500 a year, a very generous salary at the time. Rickey had coached baseball at the University of Michigan and developed a network of college contacts. Hedges originally hired him to execute the owner's vision of a farm system. Hedges had grappled with the challenge of competing with wealthier teams that could outbid him for promising players. His solution was to formalize an arrangement that clubs occasionally used to develop talent. Rather than simply loan players to minor league clubs, Hedges wanted to buy minor league teams and develop his own stars. He wanted Branch Rickey to oversee this operation. Hedges always had informal "gentlemen's agreements" with minor league clubs, under which he had "strings on" (control of) many players and later made money by selling them to others. He had already explored buying minor league teams. In 1909 he had offered Frank Farrell, part owner of the New York Americans, $45,000 for the Newark Eastern League team (Washington Post, December 18, 1909). In 1912, he wanted to buy the Kansas City team of the American Assocation and install Rickey as its president and general manager, but Rickey wasn't available at the time. In 1913, after Rickey did join the Browns, the two men tried to gain control of the Montgomery (AL) Southern Association team, where the sensational 1912 Browns rookie Del Pratt had come from. They lent money to four Alabama businessmen to buy the club, but their partnership and the deal fell apart. The concept that Rickey executed so brilliantly with the St. Louis Cardinals for more than two decades, starting in 1920, began with the vision Robert Hedges shared with him in 1912-1913. In his Branch Rickey biography, Arthur Mann relates that Hedges and Rickey spent $100,000 on 30 minor league players they drafted in September, 1913. When Rickey was asked how such spending could be justified, he replied that if just two of the men became great players, it was worth it. And a year later, Hedges would buy a promising catcher from Louisville of the American Association for $10,000, one who had been released by the Cincinnati Reds. Hank Severeid, considered by many the best catcher in the minors at the time, would go on to play more than 1,000 games for the Browns. Two developments prevented Hedges and Rickey from pursuing the farm system in 1914. First, that January, major league baseball passed a law banning the ownership of minor league teams by big league clubs. Second, the upstart Federal League declared war on organized ball and placed a team in St. Louis. Just as Robert Hedges had raided the established National League for players in 1902, the Federal League was now doing the same to the two established leagues. And just as they did in that earlier war, player salaries started to escalate, quickly and dramatically. The farm system would have to wait. Hedges shared with his fellow owners some creative ways to combat a new league. As 1914 approached, he suggested working with the American Association, a high-level minor league in the midwest (the Federal League was based in the midwest too). Organized Ball could add some midwestern teams to the majors (Globe-Democrat, January 7, 1916), to undercut the emerging Federal League. He also proposed that the two established leagues each add two more teams, to preclude the future rise of another league (Globe-Democrat, April 24, 1915). None of these proposals were adopted. The fall 1913 announcement by the Federal League that George Stovall would manage (and play for) their Kansas City team was the first "shot" in this war. Robert Hedges and Branch Rickey realized that Stovall was secretly recruiting while he was still a member of the Browns. (After he was relieved as Browns manager, he had been kept on the team as a first baseman.) While the viability of the Federal League would unfold in the future, one thing was clear from the start: "Three clubs cannot exist in this city [St. Louis], and one will have to go." (Post-Dispatch, April 16, 1914) As manager of the Kansas City Packers, George Stovall wanted to help the Browns be that team. Robert Hedges told Sporting Life about the early days of the American League, noting difficulties the Federal League would face: "I worked for nothing. When my salary came around, I deposited it in the bank one day, and the next I wrote checks on my salary to pay the ball players." (July 25, 1914) Now, as in 1902, the Browns owner did what he had to do to protect his interests, his personnel. He tracked Hamilton down in Kansas City, convinced him to return to the Browns (the exact terms of his new contract weren't revealed), and as some papers reported, "kidnapped" Hamilton back to St. Louis. He had become a "double-jumper." Ultimately, Hamilton never realized his potential, and Hedges suspended him a year later, for "dissolution" at an East St. Louis club (Globe-Democrat, May 9, 1915). It has been common talk in American League baseball circles for years and years that other magnates would not exchange with Hedges. Figures prove this... The American League, failing to shoo uncle Bob out of the league, has entered into a combination to prevent him from getting his club back in the first division. Keener also showed how the owner of the Cleveland Indians, Charles Somers, lied to Hedges about Jackson's availability, saying he would not trade Jackson, shortly before he dealt him to the Chicago White Sox. In December 1915, the Federal League war appeared about to end. All parties were wearying of the legal battles and financial losses. One of the Feds' wealthiest and most enthusiastic backers, Robert Ward of the Brooklyn team, had just died. Two of their owners, Charles Weeghman of Chicago and Phil Ball of St. Louis, were to buy established teams as part of the settlement. The Mound City was about to become a two-big-league team city once again. The original plan was for Phil Ball to buy the Cardinals. Helene Britton, owner of the Cardinals since the death of her uncle in 1911, had endured five years of friction with the all-male club of owners. More than once, she had resisted their suggestions that she sell out. Now the pressure was mounting. "A woman has no business in baseball" was what she kept hearing. The Cardinals owner, known as "Lady Bee", pushed back. She would not be pressured into selling. She raised her price and, for all practical purposes, a sale of the Cardinals was not in the cards. Despite holding his team intact for both 1914 and 1915, and despite having a creative, talented manager in Branch Rickey, Hedges' Browns finished in the second division both seasons. The Browns drew only 150,000 fans in 1915, less than one quarter of the high-water mark of 1908. The Baltimore Federal League team, which refused to be a party to any settlement, continued to pursue the Federal League's antitrust lawsuit against Organized Ball. Hedges confided to Sid Keener late in 1915, after two wars, "I've lived--well, at times it seems like five years, again like fifty--in trying to keep the team together, balancing receipts and expenses." After the 1915 season Robert Hedges sold the Browns, including the valuable real estate and modern ballpark (the Dodier Realty Company), to Phil Ball for what was variously reported as between $425,000 and $525,000. Especially when the dividends that he drew while owning the team are taken into account, Hedges made an enormous return on his $35,000 initial investment. By comparison, Helene Britton sold the Cardinals two years later for $350,000. At one point during the final negotiations, the deal got hung up over $40,000 of outstanding liabilities that showed up on the Browns' books. It turned out that the compassionate Hedges regularly made advances and loans to his players. He later served on the board of the Mercantile-Commerce Bank in St. Louis and as president of the National Bank of Commerce Liquidating Company. Near the end of his life, when Robert Hedges was battling cancer in a Santa Fe sanitarium, he spoke of buying the Cincinnati Reds for his son. (This story was told to The Sporting News on September 5, 1951 by fellow patient Paul Corrigan.) In late April 1932, Hedges died of lung cancer in St. Louis' Barnes Hospital. Robert Hedges stepped forward to rescue the American League's weakest team during the dark winter of 1901-1902. Early in his baseball career he told The Sporting News (December 20, 1902), "My baseball experience began in war times, and I was obliged to undertake obligations that I considered exacting, but I am not complaining." Hedges angered fellow owners for mastering a system of making money with a losing club. His critics said he was too cheap, yet he was the ultimate warrior in baseball's two great wars of the 20th century. "I am the only magnate who went through both wars without losing a man," he told the Globe-Democrat on January 6, 1916, shortly after he sold. And one can only wonder how and when baseball's two big wars of the 20th century would have ended, had Robert Hedges not cooperated and acted to achieve the peace. Hedges always ran his baseball operation for "a higher class of people," not the "rowdy element." His policy, wrote the Post-Dispatch on January 19, 1911, was "Clean Ball first, championship ball if we can. Money no object." He went on two buying sprees for his Browns, in 1902 and 1908, both of which brought them just short of the pennant. Yet he did not follow up on those accomplishments, which were his only two first division finishes. While few people foresaw the collapse of 1909, the Browns were limited in their ability to react to it. "The one great mistake made by Hedges," said the Post-Dispatch in 1910, "was investing $75,000 in a championship grandstand before he had a team to fit in it." You have to develop your own players these days. None of the other club owners will sell a tried-and-not-found performer. It is simply up to the club owners to purchase the raw material, place it properly and pluck it when the proper time comes.